Thank you for your interest in our auction for this ultra rare opportunity! This is 1 of 225 cars produced, number 70 to be exact. 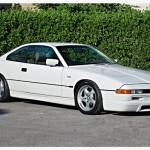 The 850CSi is the the BMW Motorsport-developed version of the E31 8 Series coupe. It is powered by the S70 V12 engine, a BMW Motorsport-enhanced version the standard production M70 powerplant. In addition, the 850CSi features a BMW Motorsport-tuned chassis and several unique cosmetic items. These cars are few and far between especially in the condition of this fine example. This particular 850 has been dealer serviced for most of its life. Last serviced completed by Braman BMW in Miami, FL on 8/23/2013 and 2/28/2014 (receipts included in sale). Rest assured this car is mechanically sound and turnkey…ready to drive! Both the V12 engine and 6 speed manual transmission are strong and smooth. This BMW has a 100% clean car fax (available upon request). The original Alpine White exterior is also in excellent condition. It has no major dents, dings or scratches. The paint shines beautifully! Minor and superficial bubbling in the sunroof area…very typical for these cars. The stunning rich beige leather interior is also in remarkable condition for its age. No major cuts, stains or scratches. The headliner is prefect. Included in the sale are the original 850 floor mats. They show their average wear and tear, but are in great condition. Also included in the sale are the original books/manuals, factory tools, spare tire and key. All electrical components are in working order, including, A/C, all four windows, mirrors, heated seats, exterior lights, radio, power seats. I have included as many photos possible to assist in my description. However, if you require additional photos and/or have any questions please feel free to contact me, Gaston via message or call/text (786) 486-7746. It’s encouraged you ask all questions before committing to buy, do not assume anything that may not be listed. This is an AS-IS sale. If you need shipping quotes please feel free contact me and I will be more than happy to coordinate all your shipping needs (at buyers expense). Thanks again for viewing, be sure to allow all 50+ photos to download and HAPPY BIDDING! This looks like a very nice example of what is a rare car. The performance of the CSi never really lived up to the “M8” promise, but it’s still a solid performer and I think the design has aged pretty well, all things considered. I like many of the details of the CSi; the Motorsports handles, the M stitched wheel, the M-System II wheels and those subtle but aggressive bumper covers look great. I’m not a fan of the ruched seats from this generation BMW, but it comes with the territory. The only other downsides I see is that there appears to be some rust on the sunroof; a bit odd for a sunny climate. Otherwise, like many of the CSis, the price is quite high; $50,000 will get you into a few Ferraris, and the badge value difference alone will have people questioning your sanity. 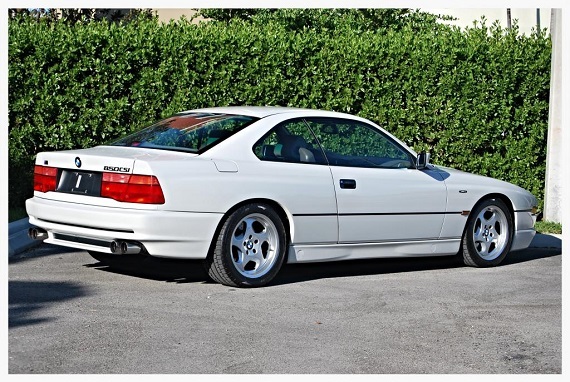 But I think if you needed to live with one of the two, the 850CSi has to be the better option. Yes, by BMW standards it’s an expensive, complicated car to run. But by Ferrari standards…. 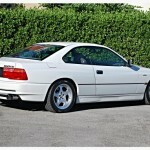 Tagged 1994, 5.6, 850CSi, BMW, forged, M System II, Motorsport GmbH, S70B56, V12. The listing has already been removed! I’ve always been a fan of this car’s elegance and “businessman brute” persona. Sadly though it could probably be spanked by a modern Nissan 370Z at half the price (and certainly not even a fraction of the charm or presence of the BMWS either). I can’t think of a modern BMW that shared fewer parts with the other cars in its lineup, no doubt this is why the cost was what it was. I bet there are fascinating stories about the design, construction, and sale of the 8-series. Interesting, the link worked earlier but was broken. I’ve updated it and it should be fixed now. The car is still available. @MDriver; actually there are two 456GTAs with a quarter of the mileage of this car on ebay right now for about the same price; a manual will set you back more, but is also much faster and again, significantly less miles. That doesn’t mean it won’t cost you a lot more nearly immediately though! 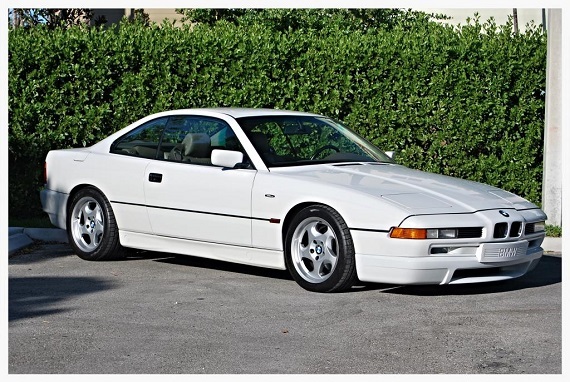 I think the pricing overall is pretty close between the 456GT, the 850CSi and the 928GTSs that come to market. I wonder how many people (not currently reading the DuPont Registry) legitimately cross shop a BMW 8er & a Ferarri 456, I doubt it’s a large percentage. If I had the dough I’d go 456 all day long. the styling isn’t particularly pretty, at least to me…. A co-worker/friend owned a 456 GTA and a 456 GT (both with low miles). He kept them both for a short time because of all the problems he had, including the high depreciation. He compared the reliability (and depreciation) to a couple of Maserati Coupe’s he used to have a few years later. no I’ve always wanted an F-Car….and the classics from the 60’s and early 70’s are beyond my budget..
and there is nothing like a V12’s sound as you row through the gears…. @Ry: you say the FF looks like a clownshoe, I say it looks like a Hyundai Veloster with tacky vents slapped on. You’ll never look at it the same….